There are a lot of clever ways to avoid the explosion from D.Va’s Self-Destruct Ultimate in Overwatch, but this Zarya trick is one of the strongest. Korean Overwatch League Commentator Jisu “AKaros” Jang published a video (with English captions by Gatamchun) that demonstrates how Zarya can actually block D.Va’s exploding mech damage for her entire team. The video takes a clip from the Seoul Dynasty versus London Spitfire Temple of Anubis match. On the second point, the Spitfire use their own Graviton Surge to group enemies up and eliminate them with a cleverly placed D.Va bomb. Without a Reinhardt shield, Seoul looks to be as good as dead, but Byung-sun “Fleta” Kim’s Zarya walks in and prevents his entire team’s death. He does this by using Zarya’s Particle Barrier on himself and walking up in front of the exploding mech. 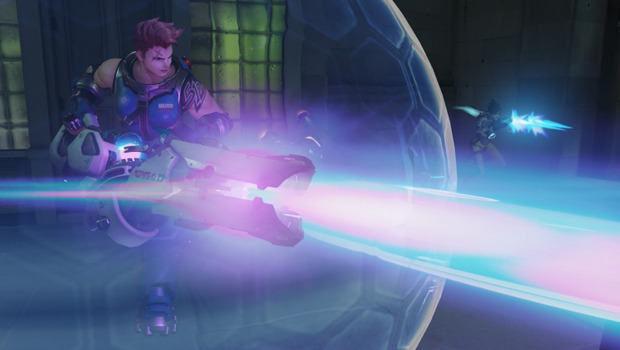 Because Zarya’s barrier blocks damage and blocks line-of-sight, the radius of the D.Va bomb is cut off as if someone held a shield up to it–thus saving the entire team. Like any barrier in this game, they can always block one instance of damage no matter how great it is. You can actually do this with Zarya’s Projected Barrier on an ally too, but coordinating that would be a whole other challenge. If done correctly, it’ll save yourself, your team, and give you an extra 40 charge to deal more damage and build your Graviton Surge faster. Be sure to time the Particle Barrier for the last second because other damage could break it earlier and the whole plan will fall apart. This works because barriers in the game block line-of-sight. You can Zarya bubble a Reinhardt’s Earthshatter to stop it from hitting anyone behind you too. It’s kind of a funny, unexplained quirk of the game, but it’s pretty useful in clutch moments like a high-stakes OWL game.